Melbourne: 2017 – In the 1980s chef Christine Matheson, was running one of Brisbane’s most iconic restaurants, Possums Australian Food in New Farm. She was serving everyone from mafia characters and politicians, to the lead players of the Fitzgerald Inquiry such as Terry Lewis and Warren Armstrong. 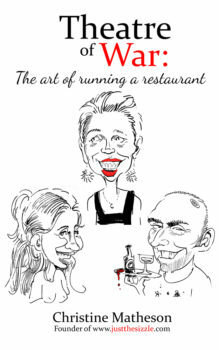 Thirty years after the inquiry she has launched her memoir, Theatre of War: The art of running a restaurant. The book relives the tough times with husbands, business partners and staff, as she rocketed through ten businesses, including a huge outlet at Expo 88 and details the massive struggles that she experienced as one Australia’s pioneer female chefs. Set during one of greatest political upheavals in Australia’s history the book has some very explosive and hilarious moments as Christine provides a front row seat to the backyard dealings of the Fitzgerald Inquiry’s characters. The story which covers her hugely eventful life will be three volumes and will have great appeal to a wide range of people from foodies, hospitality workers, to MasterChef viewers who read cookbooks and follow celebrity chefs. Today Christine is a resident of Hobart and works as an author, restaurant consultant and food critic. She is known for her brutally honest and entertaining restaurant reviews through her website www.justthesizzle.com. She has just launched Off the Hotplate, a web-driven support system for chefs experiencing mental health issues.